Last Tuesday, we were in Laguna to attend to some business in Santa Cruz. The trip took us about four hours going there and in inclement weather, it was not too pleasant. But as they say, every bad situation has a silver lining and that day, it was food. We had lunch at Grace, sister of Rose at Calamba. As usual, I got the spare ribs barbecue. We also ordered what looked like nilagang Lapu-Lapu. Used as I was to bulalo being the subject of nilaga, I was apprehensive on this fish dish. But the lapu-lapu looked so fresh that I thought, what can go wrong? I'm glad I took the leap. As it turns out, the lapu-lapu was indeed delicious! The nature of the nilaga (which literally means "boiled" in English) method of cooking did well to present the fish in its purest state. No spices, chaotic flavors, no frills. Just fresh, unadulterated lapu-lapu. On our way home, we made sure we picked up some pasalubong along the way. 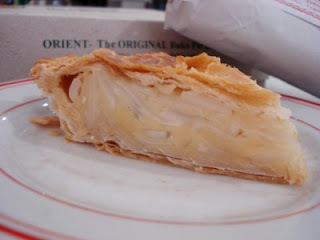 Of course, there is only one stop for the Buko Pie- the Orient pasalubong shop along Los Banos. They also make this wonderful banana bread that smells as good as it tastes. I must admit that I buy a loaf of this partly with the intention to make my car smell like freshly baked banana bread. Tee hee.. 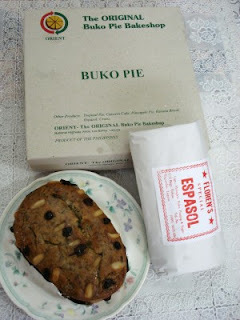 The pie sells for Php120 while the small size banana bread sells for Php40. When we got to Calamba, we felt hunger pangs again. And so happy were we with our lunch, we ducked back into to Grace, sister of Rose for an early dinner. More spare ribs barbecue, guilty as charged. Plus we added an order of kinilaw na tuna. This is another dish worth coming back for. The way they make their kinilaw na tuna here is quite unlike anything I've had and this is by far the best of the kind that I have tasted. The fresh tuna cubes are marinated in very good vinegar and heaps for minced onions, green chiles, and ginger. Makes my mouth water just remembering it. 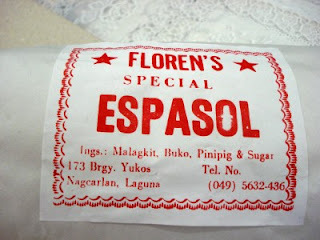 And for that famous laguna delicacy, espasol, the best I've had so far is Floren's espasol. It's not like those run of the mill espasol is peddled by ambulant vendors along Los Banos. Certainly, it is substantial in size than most. You can get this at Grace, sister of Rose for Php45 per 5-piece pack.